Criminal and family law cases can present incredibly complicated, emotional and potentially life-changing issues. Unquestionably, these cases have serious gravity, but by partnering with a skilled lawyer, you can protect your personal and professional interests while moving toward a best possible outcome for you and your loved ones. For close to four decades, the Florida attorneys at Weaver & Dorfman, P.A., have helped individuals and families in and around criminal law and family law issues in the best possible way. For more than 15 years, certified family law mediator Charles Dorfman has helped families work toward solutions to complex issues that have preserved financial and emotional health. Kenneth N. Weaver Jr. has helped defend those charged with state and federal offenses reach acquittals and mitigate consequences for nearly a quarter century. Both of our attorneys understand the need to tailor the approach to the situation, goals and circumstances of each case and client. Both are adept at negotiation and are more than comfortable in the courtroom. Regardless of your case, we encourage you to get in touch to protect your rights and well-being. 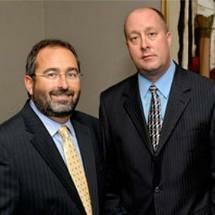 We offer free initial consultations and accept payment plans for all criminal defense issues. To schedule an initial consultation with one of our Melbourne family law and criminal defense lawyers, call 321-426-1882 or email the law firm of Weaver & Dorfman, P.A.